The Shoshone tribe, often referred to as the Shoshoni or Snake Indians, consist of several distinct groups, of which there are different bands. Originally living in a wide area of the Great Basin and Great Plains and sharing similar Shoshone languages, they are closely related to the Comanche, Paiute, and Ute Indians. By the mid 18th century, the Blackfoot, Blood, Piegan, and Crow to the north and the Sioux, Cheyenne, and Arapaho to the east were well better armed and had an abundant supply of horses. These competing tribes soon pushed the Shoshone south from the northern plains and west of the Continental Divide. The first white men to explore the west were the trappers and explorers. Sacagawea, a Lemhi Shoshone woman, led Lewis and Clark through the west to the Pacific Ocean. By the time the Europeans began to move into the Great Basin and Snake River areas in the 1840’s, there were seven distinct groups of Shoshone, with very few seen east of the Continental Divide. By that time the tribe limited their excursions east only to hunt buffalo, limiting their stays to short periods. When the white settlers pushed westward the Shoshone tribe also succumbed to epidemics of small-pox and other diseases previously unknown to them, which decimated the tribe and diminished its power. By this time, the Northern Shoshone and Bannock hunted in the Snake River Valley, the Camus Prairie, and the Portneuf and Sawtooth Mountains, while a Shoshone group called the Sheepeaters lived primarily in the Yellowstone country. 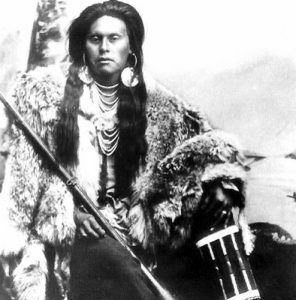 The Eastern Shoshone, led by Chief Washakie spent most of their time in the Wind River and Bighorn Mountains. Two other divisions having similar cultures were the Goshute Shoshone, who lived in the valleys and mountains west and southwest of Great Salt Lake; and the largest group, the Western Shoshone, occupied what is today, northwest Nevada. Four other groups, generally called the Northern Shoshone, were scattered about Montana, Idaho, and Utah. The basis of the Shoshone religion was a belief in dreams, visions, and a Creator; and fostered individual self-reliance, courage, and the wisdom to meet life’s problems in a difficult environment. Most of the Shoshone ceremonies are dances similar to the Great Basin Round Dances. The Bannock shared the warfare practices of the Plains Indians, which included counting coups and taking scalps of enemies. They adopted the Scalp Dance from the plains tribes and during the reservation period began dancing the Sun Dance. Today, the Sun Dance, a very important event, is held each summer. When the first Mormon pioneers began to settle in northern Utah they encountered three major bands of Shoshone who had adopted most of the plains culture, utilizing the horse for mobility and hunting game. However, as the Mormon farmers began to take over their traditional homelands, and more settlers moved westward along the Oregon and California Trails, the pioneers took over much of their land and wasted their food supplies. As a result, Chief Bear Hunter began to strike back in 1862 by raiding Mormon cattle herds and attacking mining parties traveling to and from Montana. The Shoshone aggression ended in what has become known as the Bear River Massacre on January 29, 1863. On that morning, Colonel Patrick Edward Connor led about 200 California volunteers from Camp Douglas in Salt Lake City to assault the winter camp of Chief Bear Hunter. Encamped at the confluence of Bear River and Bear Creek in the Cache Valley were about 450 men, women and children. The troops approached in the early morning darkness around 6:00 a.m. After two hours of firing, the Indians were out of ammunition and the next two hours of the battle became a massacre as the volunteers shot indiscriminately into the camp. 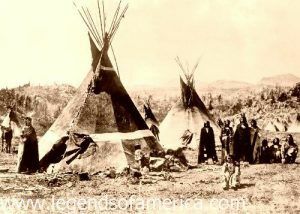 When it was over, 250 of the Shoshone lay dead, compared to about 23 soldiers who lost their lives. Chief Bear Hunter was killed in the battle and the remainder of the tribe, under Chief Sagwitch and the chiefs of nine other Northwestern bands of Shoshone signed the Treaty of Box Elder at Brigham City, Utah, on July 30, 1863. After the treaty was signed, the government immediately began to force the Shoshone to move on to the newly founded Fort Hall Indian Reservation in Idaho. After several years, most of the Shoshone finally gave up roaming their homelands in Utah and settled on the reservation, where their descendants continue to live today. During the period between 1863 and 1939, the Eastern Shoshone and Shoshone-Bannock tribes saw their reserved lands, which once covered five states, reduced to parcels making up an area one-twentieth the size of the original reserves. Today, the Shoshone’s approximately 10,000 members primarily live on several reservations in Wyoming, Idaho, and Nevada, the largest of which is the Wind River Reservation in Wyoming. The Wind River Reservation now consisting of approximately 3,500 square miles is located in Fremont and Hot Springs Counties in west central Wyoming. The Fort Hall Reservation of the Shoshone-Bannock tribes is located in southeastern Idaho. Originally encompassing some 1.8 million acres of land, it was later reduced to 544,000 acres. Well over a century later, the Eastern Shoshone and the Shoshone-Bannock have preserved much of their traditional lands and retain their traditional ceremonies, holding the annual Sun Dance on the Fort Hall and Wind River Reservations. Tribal members also host annual powwows, and continue to engage in sweat ceremonies to pray for individuals, families, or the tribe.